Mayda is an Uzbek word meaning ‘small, tiny, fine’. Mayda is an English ‘nursing chair’ from the Edwardian period around 1900. The chair has been decorated with wood carvings. 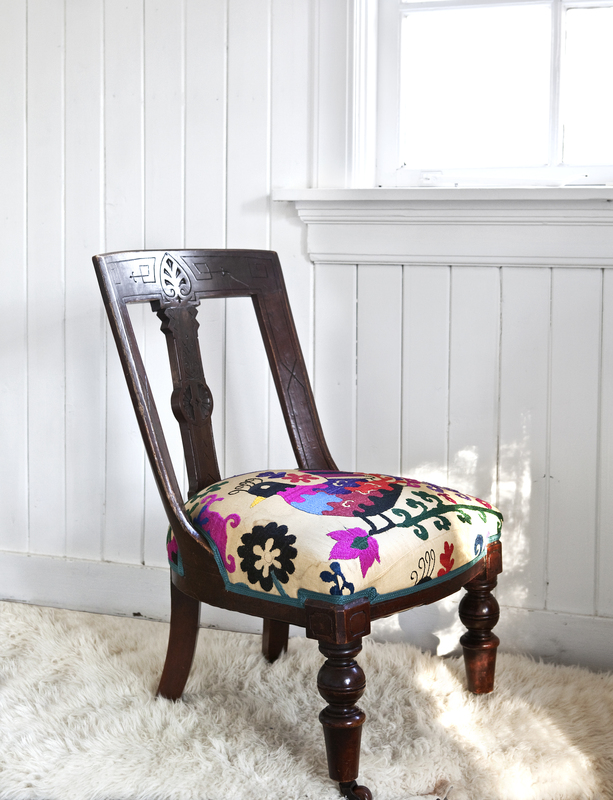 The seat is upholstered with a Suzani fabric from Uzbekistan. Suzanis are embroidered pieces of cloth made by women in the region of Central Asia. An unbelievable amount of time and care goes into the making of each suzani. Suzanis used to be dyed with natural pigments extracted from, for example, the root of the madder plant, walnuts, indigo plants, pomegranates and sumac berries. The suzani of Mayda shows flowers and a bird. The bird motif represents a creature bridging the real and mythic worlds. Most people believe that the flower motives are symbols of fertility and prosperity.